You've seen them in your neighborhood. You see them in the mall parking lots. You know they are the most economical form of transportation. Scooters are increasingly becoming more popular in our country. For years, scooters have been the primary mode of transportation in the east. Until recently, they were rare in the United States. However with unstable gas prices and a shaky economy, scooters have been making their way into the American forefront. Everyone from college students to senior citizens seems to be riding one. And why not? They are a tenth the price of a car. Insurance is very low priced. And let's see what else, oh yeah; did I mention the average scooter can rack up 65 mpg! Click here to see my lineup of Scooters at wholesale prices! Click here for FREE scooter maintenance tips! Looking for information on tuning your mini bike or pocket bike?Click Here! If you have decided you want a scooter, or maybe at least you're considering one, there are a few things you should know and consider. Scooters come in different sizes. Different in engine size as well as body design. China made scooters are the topic of our discussion here, so I'm going to mention the three main sizes that are generally available. The smallest size is the 50cc, or sometimes called 49cc. This scooter is not very practical for highway use with an average top speed of 30 mph. However, it does have a place in the market. This scooter is great for kids or beginners. It is lightweight, easy to control and will get around 80+ mpg. This makes a 50cc scooter ideal also for college students needing to get around campus. Other uses for this small scooter may include neighborhood riding, parks, and it's great to take camping. Every states laws may be different as far as whether or not it is legal to ride a 50cc on the highway. Check with your local OMV to be sure. Want to learn how to ride a motorcycle? Click Here! Next up is the 150cc scooter. These scooters are by far the most popular on the highway out of the china made scooters. This scooter is more than large enough for the average adult, but not so big that it's intimidating. The 150cc scooter is capable of speeds of around 60mph and will average 65+ mpg.In speeds zones of 45 or 50 mph, the 150 will do just fine. You can even carry a passenger on this one. All 150cc scooters are not alike though. Some are larger are smaller than others. Some offer options such as a glove box or trunk. Some are sporty, while some are more about luxury and touring. Mostly all of them have one thing in common. The GY6 engine. This engine was invented by Honda during the early 80's. It has now been adopted by most all china made scooter manufacturers. 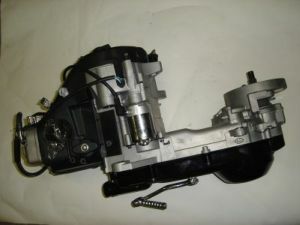 This along with the CVT belt drive transmission is a common feature on scooters. Lastly, we have the 250cc scooter. These scooters are big and more complex. The smaller scooters usually have electric start and kick start back-up. 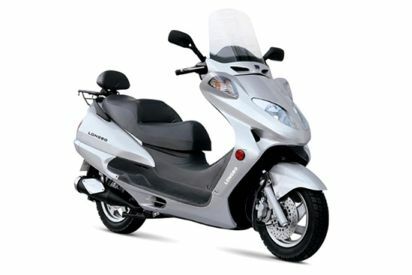 The 250cc scooter generally has only electric start. These are often water cooled engines compared to the air cooled 50cc and 150cc. These scooters are capable of speeds of around 80 mph and will get about 55+ mpg. They are quite a bit heavier. This scooter is good if you have alot of freeway travel. It is recommended for the more experienced rider. The size is not much different than large 150cc scooters, but you will notice quite a bit of difference in power. So, now that you know there sizes, are you ready for more? Great because scooters can offer years of use if you know how to maintain them. In the next pages, we will discuss their features along with general maintenance and repair tips. After all, it's not saving you any money if you can't use it!